Last year’s solar deployment numbers just came in, and they are, in a word, phenomenal. Utilities bought more new solar capacity than they did natural gas capacity: an astounding 22 states added more than 100 MW of solar each. At the same time, there is grim news about delays in construction and associated cost over-runs for nuclear plant construction projects in Georgia and South Carolina. SCANA—owner of South Carolina Electric & Gas and sponsor of the VC Summer Nuclear Project—has just reported new delays in the in-service dates of its new reactors to 2020. Construction started more than 7 years ago, with energy deliveries promised to begin in 2016. Neighbors with solar. Courtesy of Grid Alternatives. Past hopes for a “renaissance” in nuclear power in the United States, with five new nuclear reactors at three existing plants projected to come online in America between 2016 and 2020, have been overwhelmed by competition. UCS predicted this trend in costs many times. Meanwhile, there is much to say about the solar boom. Just ask one of your 1,300,000 neighbors who have solar on their property. To put these achievements in perspective, let’s talk about solar jobs and productivity. The solar industry employs more than 260,000 people in the United States. The continuous improvement in know-how in construction techniques and in manufacturing drives down solar deployment costs every 3 months. The pricing for new solar projects is coming in the range of 4 cents (Texas) to 5 cents (California) per kilowatthour. In comparison with nuclear, the amount of solar power built in 2016, taking into account how many hours each can operate each day, is the equivalent of more than 3 new nuclear plants. To dive in a little deeper: let’s use a 25 percent capacity factor for new solar, making the 14,626 MW installed equivalent to 3,650 MW of theoretically perfectly running nuclear plants. The Westinghouse AP 1000 units under construction for the last 7-10+ years produce about 1,100 MW. So, in one year, solar additions were equal to what takes more than 7 years to build. The difference in speed of deployment is why UCS is clear that nuclear power isn’t a near-term climate solution. Despite the handful of new reactors under construction, US nuclear generation is on the decline. Struggles to keep existing plants open in competitive markets are roiling the electricity markets. But the recent news about the very few manufacturing firms supplying nuclear construction illustrates how very different the nuclear industry is from solar. Cost over-runs in the US plants are so large that when state regulators finally put a cap on what South Carolina and Georgia consumers would pay, manufacturer Toshiba (owner of Westinghouse) found itself with $6 Billion in losses and the likely end of its business in nuclear power plant construction. The concentration of nuclear component manufacturing in so few companies has shown how a problem with quality led to a “single point of failure” plaguing the fleet of French nuclear plants. Policy in the US has been to shield the utility companies from the risks of their business decisions to construct nuclear plants, continuing with the Vogtle plant in Georgia. Would we ever go 100% solar? Would we ever build only solar? Maybe, but that’s not the right question. “What can we do with lots of solar?” is a better one. We can keep absorbing the solar pattern of production with the tools we have. We can plan to adjust to cheap energy in the middle of the day with time-varying rates. 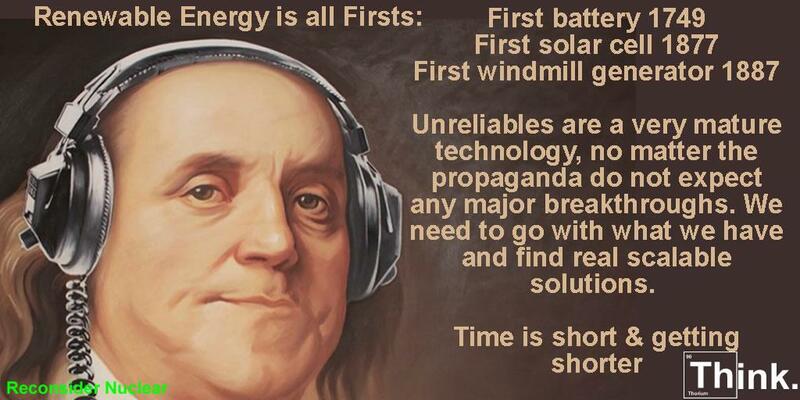 And if we can get energy storage further along, we can get to the end of this debate. clear up the misconceptions from the industry, in promoting their own products. Interesting that it is never accounted that cost-effective batteries/energy storage does not exist and is ever far from reality and that intermittent renewables (mainly solar and wind) have strong dependence on fossil fuels to keep lights on when sun is not shinning or wind is not blowing or during prolonged droughts and that most of their components are not manufactured in wind/solar-powered factories but with fossil fuels. Intermittent renewables are neither clean nor carbon-free. Solar and wind are not helping to curb CO2 emissions, not in Germany, not in California, not in Vermont, and nowhere. In this way, nuclear power can be accounted as the only “virtually” carbon-free energy source. Thanks for a very concise, yet complete, comparison! There is a simple question. Why does the UoCS lie about nuclear power? You imply that VC Summer units 2 & 3 have been under “construction” for over 7 years when they only received their license in March 2012, and actual construction work didn’t begin on unit 2 until March 9, 2013. Denigrating nuclear power while being unrealistic about the capabilities of wind and solar PV to replace fossil fuels is not very scientific. It makes me wonder if you are more committed to fighting Climate Change or to Green ideology. They were given permission to start initial site prep and some construction years before that. I don’t think UCS is distorting this at all. Well, you would be wrong. They could do initial site prep work while waiting for their license. And, they when that was done, all that they could do would be to sit and wait for the license. I don’t think that time spent sitting and waiting for the license counts as time spent constructing the power plant. Notice the deceptive way that the author phrased it so you will think that it does. However, they certainly were not allowed to do any actual construction on the nuclear power plants until they received the license. In fact, they were not allowed to even do all of the grading work for the actual power plants until they had the license because it is “safety related”. After they received the license, it was a year before they were ready to pour the Basemat. You can count that year if you want to although in the industry, it isn’t counted. Even if you count from the day they received the license, it is only a bit less than 5 years. A gigawatt of intermittent energy is not equivalent to a gigawatt of reliable carbon-free nuclear energy. Intermittent energy needs fossil fuels to keep lights on when sun is not shinning or wind is not blowing or during prolonged droughts because cost-effective batteries do not exist and are ever far from reality. Solar and wind are not helping to curb CO2 emissions, not in Germany, not in California, and nowhere. Intermittent renewables are just a high-cost mystical placebo. Nuclear is not carbon-free. 19 of 20 steps require oil or coal to be accomplished. Uranium mining requires oil. Milling requires oil and electrical grid energy, etc. 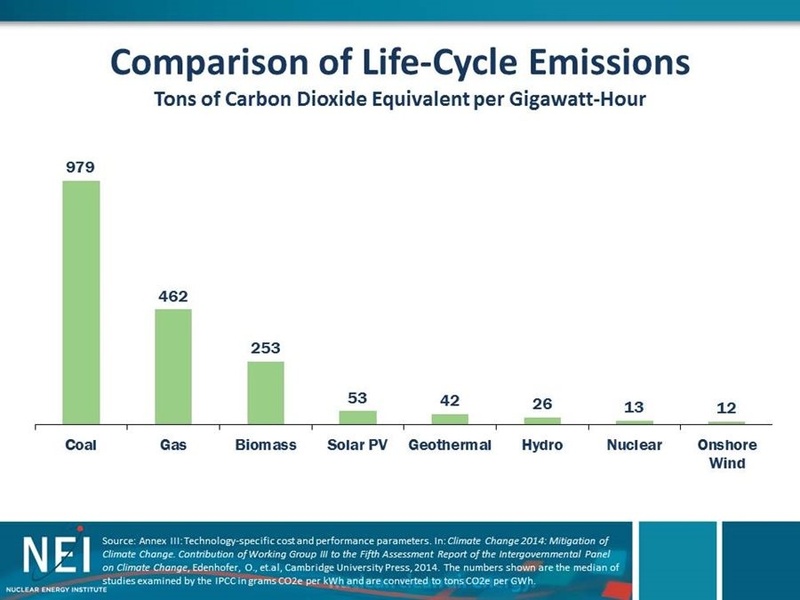 Solar is not carbon free either, but is much lower in lifecycle emissions. Wind is even lower than solar, so far. Manufacturing efficiency improvements in solar keep cutting its life cycle analysis of emissions, so in the long run, solar might beat wind embedded CO2 emissions. 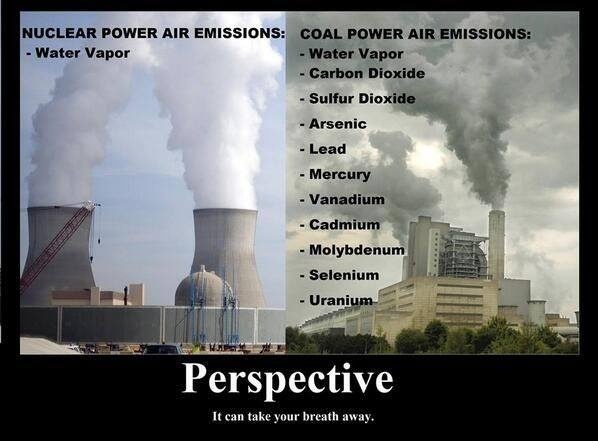 Nuclear has the lowest CO2 emission per unit of energy of produced, so it is “virtually” emission free. Cost-effective energy storage does not exist, wind and solar have strong dependence on fossil fuels to compensate intermittencies. Intermittent renewables are far from being really carbon-free and cost-effective. The studies done that indicate nuclear is that low are financed by the nuclear industry. Knowing this, two meta studies were done to clear clear up this misconception. When these studies are averaged, both meta studies put nuclear at 65 grams per kilowatt-hour. You have to add to that though, more CO2 from the nuclear cycle from the occasional nuclear meltdown, and the rebuilding of infrastructure, etc. Also, add to that the long-term waste management from the 7 steps of waste management from the nuclear cycle that most of the studies covered by the meta studies do not adequately include. Do you actually think that when we have converted everything to electricity or climate neutral synthetic fuels that we will continue to use petroleum to mine Uranium? And, refine it? And, produce the fuel? And, might I ask why you don’t presume that the electric grid power used comes from nuclear power? Current LWRs have a very small Carbon foot print. And you are wrong about Silicon based solar. We have seen the exponential decrease of the price of Silicon solar cells and the panels made with them. However, we have reached the point that this curve is bottoming out and the further gains are insignificant for the cells and very small for the panels. Silicon solar PV cells require a great deal of energy to refine the Silicon. And then it takes electric power to make solar cells out of the Silicon. I am presuming that you know very little about the actual process of how Silicon solar PV cells are made. If you did, you would understand that there is very little room to look for energy inefficiencies to reduce the amount of energy and electric power used. There will be reductions in the cost of solar PV cells. However, it will not be by the refinement of Silicon technology. Silicon technology is totally mature. It will be by some new disruptive technology that is different, more efficient, and cheaper. Tim- I appreciate your attention to the comparison that a gigawatt of solar is not equivalent to a gigawatt of nuclear. I said exactly this in the blog. To make the comparison for energy produced, I suggested a 25% capacity factor for solar to a theoretical 100% perfect capacity factor for nuclear. Both nuclear plants and renewables need the rest of the generation and load management system to make the grid reliable. Grid operators maintain spinning reserves for the loss of a nuclear unit, because all 1,100 MW can be lost from a single switch or breaker operating. Operations with solar certainly need to recognize sunset. These needs, and the positive contributions to reducing fossil fuel use (and thus CO2) from running nuclear, solar, and wind, are well-known in the electric power industry. Thanks for such a clear analysis of the extent to which nuclear power is inefficient and very costly. When/how will the politicians charged with making these decisions about how we meet out power needs get the message?!? What can UCS members do to help drive the message home further in South Carolina, Georgia, and other states still pursuing these costly and dangerous projects? The Union of Concerned Scientists know that we can’t get all of our electricity from wind and solar PV. They are at least honest enough not to try to sell that Green fairy tale. The consensus is that we can obtain about 30% of our electricity from wind and solar PV without storage which is not available and will probably not be available at a cost that is economic for general purpose grid storage till 2050. So, do you want to continue to use fossil fuels (e.g. natural gas) for the rest of our power not provided by hydro and nuclear? Or, do you want to eliminate the use of nuclear power to eliminate the use of coal and natural gas to generate electricity? Surely solar and wind alone cannot get to 100%, but with demand-side energy management, renewables and storage technologies, we will get to 100% with that combo. Cost-effective storage technologies do not exist and are ever far from reality. You are obviously a member of the anti-nuclear cabal. What does demand side management mean? That means that you won’t be able to use electricity when you want to. Like some sort of 3rd World Country. The average person isn’t going to tolerate this. Storage technologies that are economically practical should not be expected until 2050. Recent research in Germany indicates that battery type storage will not be suitable for wind because it has a cycle of days. You Green fairy tale simply will not work. Germany is currently finding this out. Without nuclear power and advanced nuclear power, we face catastrophic Climate Change. Have you concidered what they will do in the developing countries where people have very little or no electricity. Do you think that demand management will work there. Do you think that people will be willing to remain in energy poverty?